This is a wonderful image and caption – it brings to mind the reason that my father banned me from every playing Golf again at the age of 17 when we visited a 9-hold course with my cousins, my brother and my uncle (all of whom actually PLAYED golf, unlike me). They laughed and teased me mercilessly until I exploded, tipped the contents of my bag on the ground and proceeded to lob all the clubs hither and thither before stomping dramatically away from them all. I am content never to play again. Very happy. So glad to see you!! I was starting to worry. Thank you …. for paying any heed at all. I am well and a little wide-eyed but not legless and that is all to the good!! Haha — I’m a terrible golfer, too. My parents had my siblings all take golf lessons, but not me. When I asked them about it as an adult, they said that I had enough other things to keep me busy. I suspect they knew that my personality and golf would not go well together. The club in the photo isn’t mine. I found it in a series of pictures of my brother playing, so I suspect he is the culprit. Dreadful golfers of the world unite …. we know our place! lol@ dreadful golfers…I so agree. 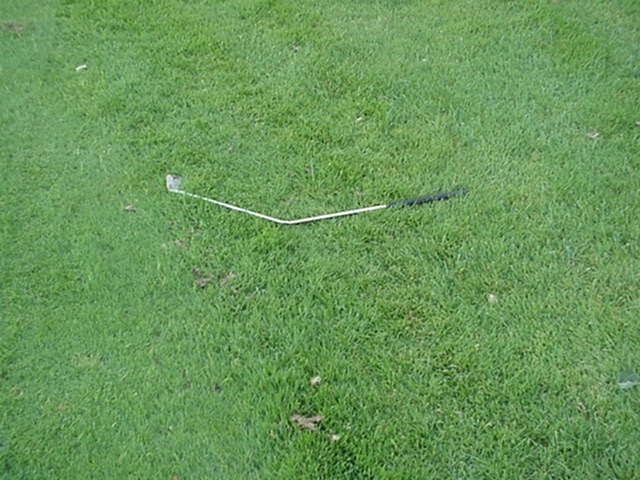 I loved the bent golf club. There in lies the tale! In my experience golfers tend to have tempers.